Louisiana Tech University’s admission requirements have become increasingly selective over the past several years and becoming part of the Tech family can offer some academic challenges for even some of the best students. But where there’s a will, there’s a way. Bridge to Bulldogs is a program, in partnership with Bossier Parish Community College, designed to help students who might just miss the ACT/SAT scores for admission or may fall just short in other areas, and offer them a pathway to admission to Louisiana Tech. Pamela Ford, dean of enrollment management, said students who have a high GPA and demonstrate motivation to learn are hand-selected for the program, which will help them become a member of the Louisiana Tech student body. Studies show that students who have a strong GPA in high school are likely to do well in college, so Louisiana Tech is scoping out those students for Bridge to Bulldogs. 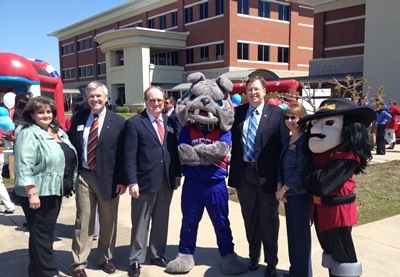 Leaders from Louisiana Tech and Bossier Parish Community College celebrate Bridge to Bulldogs during recent Tech Day at BPCC. Unlike similar programs seen popping up at institutes across the nation, Bridge to Bulldogs’ participants only need to successfully complete a five-week summer session instead of a yearlong program. Melanie Peel, director of students in transition, said Bridge to Bulldogs gives students the opportunity to experience life at Louisiana Tech while taking Bossier Parish Community College-offered courses on Tech’s campus. At the end of the program, Bridge to Bulldogs students who meet the requirements earn automatic admission into Louisiana Tech. The class schedules for the Bridge to Bulldogs program are specifically designed to guarantee a smooth transition into the quarter system in the fall. Peel emphasized that the program setting and approach will be much like that of a summer camp, where students take all of their courses together, live in the same apartment complex, have meals together, have programming opportunities specifically for Bridge students and receive support from peer mentors. Bridge to Bulldogs will not only be an opportunity for future Bulldogs, but also expands collaboration with Louisiana Tech’s community college partner, Bossier Parish Community College (BPCC). Peel said Bridge to Bulldogs staff at both BPCC and Louisiana Tech are committed to providing students with the educational tools and services they need to achieve. “This program will help bring in these strong students so that they can achieve their goal of being a Bulldog and help boost enrollment—both of which I consider to be win/win situations,” she said. Although this is Louisiana Tech’s first program like this, Peel and Ford are both confident in its success. Bridge to Bulldogs’ ultimate goal is for to students to “successfully cross the bridge” and transfer to Louisiana Tech, she said. The Louisiana Tech admissions team is working hard to select students to invite into the program based on ACT/SAT scores, high school GPA, and demonstrated academic enthusiasm. Emails have been sent to high school counselors, and Tech is also accepting referrals from high school personnel, Louisiana Tech faculty, staff, alumni and more. If you know someone who might benefit from knowing about this program, please have them contact Ford or Peel at 318-257-3036, so they can have their chance at being a Bulldog, too.